Beer photo ops are an important part of Obama v. Romney race, a historic presidential contest with no WASP candidate. Neither Obama-Biden nor Romney-Ryan are White Anglo-Saxon Protestants, or WASPS, who have dominated America's top leadership throughout American history. Mitt Romney is Mormon and a teetotaler and Obama is Protestant. In fact, polls show that President Barack Obama is incorrectly thought to be Muslim by one in six American voters, and only one quarter of voters can correctly identify him as a Protestant. Over 60 percent of Republican voters know that Mitt Romney is Mormon. Less than half of Catholic and Democratic voters know this. Joe Biden and Paul Ryan, the VP candidates, are both Catholic. What's beer got to do with it? It seems the Obama campaign knows that the American voters have long identified with a candidate in polls as someone with whom they’d prefer to drink a beer. 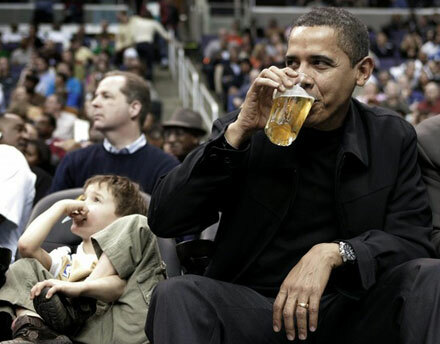 Recently, Obama has been shown drinking beer with voters at the Iowa State Fair. Earlier he did the same at a campaign stop in Ohio. Drinking beer with voters helps Obama differentiate himself from Mitt Romney who, as a practicing Mormon, does not drink beer or any other alcoholic beverage. As a bonus, beer photo ops might also help Obama distance himself from Islam and Muslims to increase his appeal to the "working class white" voters, an important constituency in presidential elections. As to the absence of a WASP from the top of the tickets, it's symptomatic of power shift happening at the top. The percentage of Protestants in Congress has dropped to 55% from 74% in 1961, according to Pew Forum. Jews now account for 7% of the US Congress overall and 12% of the US Senate. The corner offices of the top banks, once ruled by Rockefellers and Bakers, now include dozens of Jews, an Indian-American and the grandson of a Greek immigrant, according to Wall Street Journal. There are no WASP judges on the US Supreme Court bench. Three of the top judges are Jews. The remaining 6 are Catholics. It would be wrong to assume, however, that the power of America's WASP establishment is nearing an end, just as it was a mistake to expect Obama's election to presidency as the beginning of post-racial America. For those who somehow missed it when growing up, “Atlas Shrugged” is a fantasy in which the world’s productive people — the “job creators,” if you like — withdraw their services from an ungrateful society. The novel’s centerpiece is a 64-page speech by John Galt, the angry elite’s ringleader; even Friedrich Hayek admitted that he never made it through that part. Yet the book is a perennial favorite among adolescent boys. Most boys eventually outgrow it. Some, however, remain devotees for life. And Mr. Ryan is one of those devotees. True, in recent years, he has tried to downplay his Randism, calling it an “urban legend.” It’s not hard to see why: Rand’s fervent atheism — not to mention her declaration that “abortion is a moral right” — isn’t what the G.O.P. base wants to hear. But Mr. Ryan is being disingenuous. In 2005, he told the Atlas Society, which is devoted to promoting Rand’s ideas, that she inspired his political career: “If I had to credit one thinker, one person, it would be Ayn Rand.” He also declared that Rand’s work was required reading for his staff and interns. Somehow, I doubt that Americans forced to rely on unemployment benefits and food stamps in a depressed economy feel that they’re living in a comfortable hammock. But wait, there’s more: “Atlas Shrugged” apparently shaped Mr. Ryan’s views on monetary policy, views that he clings to despite having been repeatedly, completely wrong in his predictions. Since then, inflation has remained quiescent while long-term rates have plunged — and the U.S. economy would surely be in much worse shape than it is if Mr. Bernanke had allowed himself to be bullied into monetary tightening. But Mr. Ryan seems undaunted in his monetary views. Why?